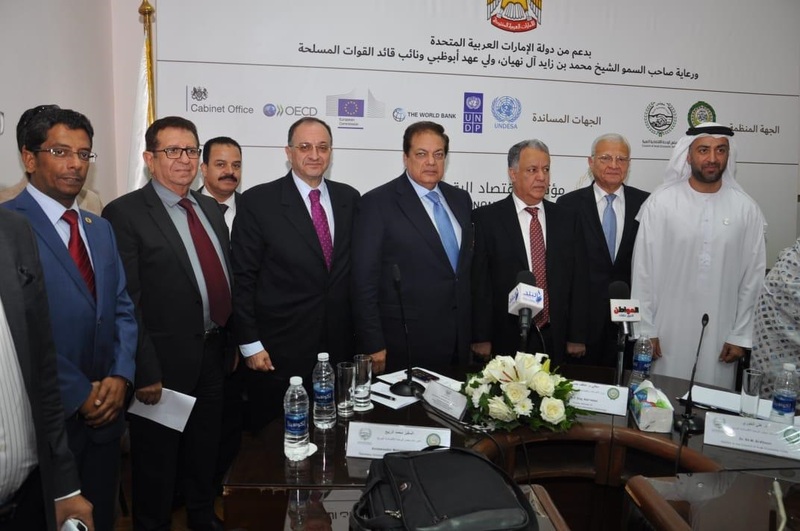 HE Dr. MamdouhRefaei, Chairman of the Arab Union of Customs Executives (AUCE) participated in the events of the press conference held at the headquarters of the General Secretariat of the Arab Economic Unity Council on ‘Digital Economy in the Arab Countries’. The conference was held in the presence of HE Mr. Mohammed Al Rabee, Secretary General of the Arab Economic Unity Council (AEUC), and Dr. Ali El-Khoury, AEUC Advisor and Chairman of the Arab Federation of Digital Economy (under foundation), and Mr. Mohamed Abu El-Enayen, Chairman of the Council of Elders and the AEUC Advisory Panel. During the events of the conference, Dr. Refaei raised an important question about the role of this conference in activating the Arab customs union. Responses came about that this conference is considered the intention of Arab solidarity and cooperation among them, especially in light of the fact that the Arab millennium generation is keen on knowledge of technology and has the potential of success in terms of software and electronics alike – adding that the success in increasing the digital economy contributes to revitalization of the Arab Customs Union. HE Ambassador Mohammed Al-Rabei pointed out that when the joint Arab market was launched in 1964, we have aspirations in the vision of a common economic unity among the Arab countries.Even though it has not been achieved according to the intended levels, but there is a renewed hope that there is a real opportunity to advance our Arab world through the digital economy. It is worth mentioning that this conference was held to announce the "Digital Economy Conference" in Abu Dhabi from 16-17 December 2018.